1/2 in. Furniture Grade PVC Pipe | FORMUFIT - Buy Online — Tagged "Size: 1/2 in." Home 1/2 in. Furniture Grade PVC Pipe 1/2 in. FORMUFIT 1/2" Structural Grade PVC pipe is a top-of-the-line PVC pipe. Made from UV resistant Furniture Grade PVC resins, it will resist and withstand harsh sunlight and fluorescent lighting. 1/2" PVC pipe is our smallest size, and is perfect for prototyping or for school projects, such as science fairs. 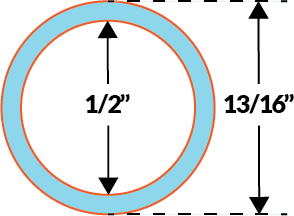 All FORMUFIT 1/2" PVC Pipe is Schedule 40, which has an outside diameter of 13/16" (0.840") with an average inside diameter of 0.622 inches.